The military uses it. Makers of poisonous substances use it. Nineteenth century sports clubs used it. Wherever a skull and crossbones flies or is branded, you're likely to get hurt, poisoned or competitively beaten, or find yourself in close proximity to death. The earliest usage of the symbol was as a marker at European cemeteries: often real bones were rigged up as signs. The image was taken to the New World by Spanish missionaries, and its uses evolved from there. 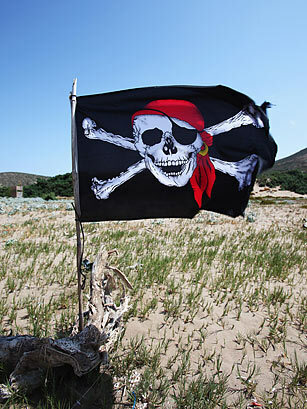 It's now most closely linked to pirates flying the iconic Jolly Roger  the name of which stems from the name of a particularly famous pirating vessel or that of a fearsome Tamil corsair, or from an old appellation for the devil himself.